I am looking forward to sharing our project creations from this past weekend. They will be shown through this week while I am on...Spring Break!!!! WOOHOO! I am blessed to be at a retreat this weekend with my friend and sideline, through Close To My Heart, Sundi Hendrix. She was generous enough to allow me to crash her team retreat and it has been a blast! I have created several projects and learned several new techniques and projects ideas. 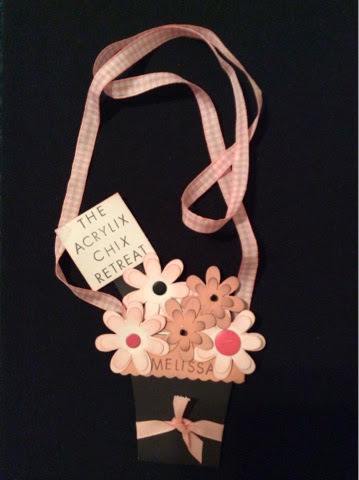 This cute idea is created from a brown paper back. In the pocket is a bite size Hershey's bar, a Peep, and some graham crackers. It is the perfect Easter treat and message. I hope you are enjoying your weekend as must as I am! See you again tomorrow! Get your Studio J™ layouts for only $5 each during the month of March! Fast and easy layouts for a fraction of the price! 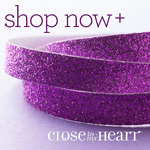 Create your account your FREE and see what all the hoopla is about by clicking here! This special only lasts through the end of March! Sometimes it’s the details of a page that makes it really shine. But adding some glitter paper, Shimmer Trim, and glitter gems doesn’t hurt, either! Learn how to make a sparkly bouquet of balloons by combining embellishments, Cricut® cutouts, and specialty paper. You will get carried away by these glitzy decorations. Isn't this technique too fun?! 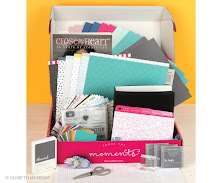 I can't wait to give it a try on a card, layout, or other papercrafting project. Always love a technique incorporating bling! Wishing you an awesome week full of sunshine and creativity! One of the fun things I enjoy about hosting/attending retreats are the fun gift exchanges. I had a gift to give my secret sister which needed a fun package. 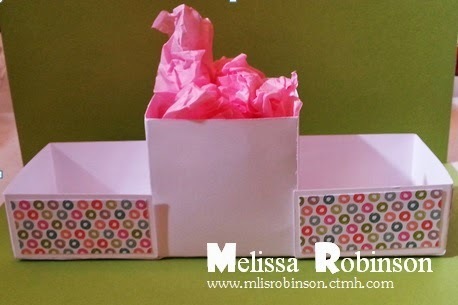 I have made boxes before but sought out to search for a new pattern and this is what I found. Isn't it cute?! It opens up as shown below so I made the "strap" and bow detachable where it would just slide off and could be replaced easily. The Present Box tutorial can be found here. 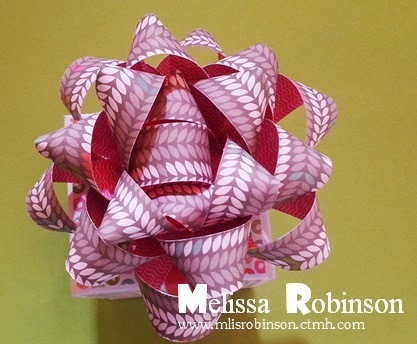 I have made paper bows before, but it has been awhile, so as I searched online for a tutorial, I found one that was a little different. I decided to give it a try and liked the result. This bow is a little more full than the the ones I have made before. You can find the Bow tutorial here. 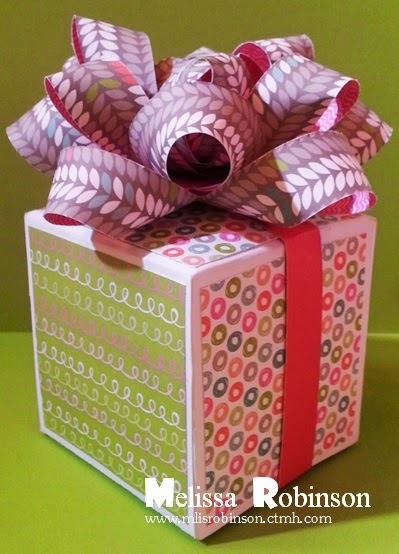 Packaging a gift in a fun and attractive way adds more value to the gift. Gotta love when you can make it out of supplies you currently own. Give these patterns a try and let me know what you think! $5 Layouts for Ten More Days! 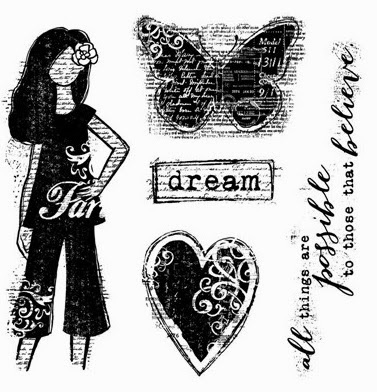 layouts using our wide selection of papers, collections, patterns, and embellishments. Sign up for a FREE account by clicking HERE and give Studio J a try! I am always available should you have questions. You will love it once you try it! *Offer valid March 1–31, 2014. Studio J layouts ship in a protected box that can hold from 4 to 50 two-page layouts. Minimum order of 4 layouts. 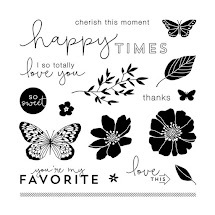 Free JPEG of every printed layout. For additional information about shipping and handling, please visit StudioJ.com > Products and Pricing > Shipping Options. and will give no reprints or refunds in such cases. 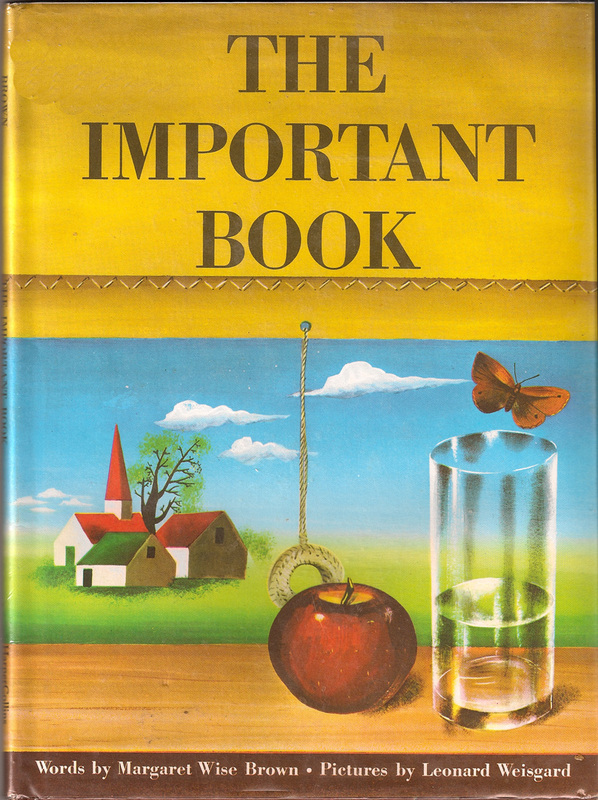 This is the cover of "The Important Book" which I ordered from Amazon. Here is a page I found online on one of many of the pages contained in the book. 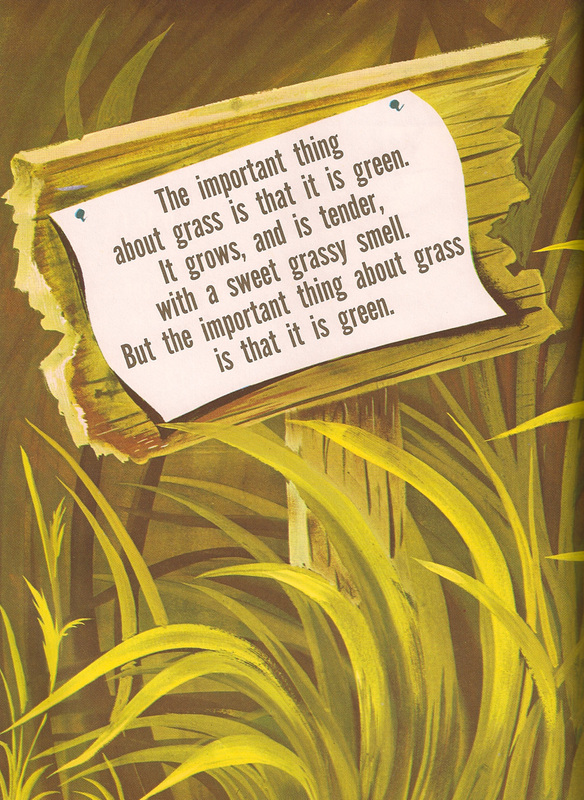 The author writes about a spoon, a daisy, the rain, and other items (mostly from nature) in the same way as shown below about grass. You will notice the first and last lines are the same. They identify the noun to be described. The next few lines contain verbs which describe the noun selected. I have done poem/journaling activity focusing on various nouns like me, the sunset, etc. Here is a sample I did for my staff a few weeks ago. is I am the Principal. and I want to make a difference. and I have worked hard for it. I have considered doing a scrapbook album that focuses on the important things. Wouldn't it be fun to do so, making my own "book"? I think I might just do it! I would love to know what you think of this idea and challenge you to try it yourself. I believe it is a great way to journal, especially for those who find it a little intimidating. 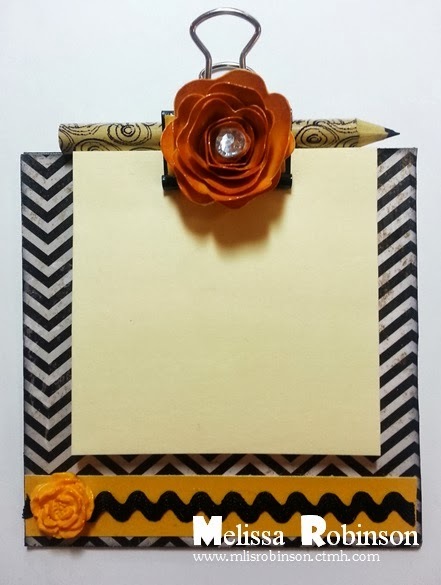 I am participating in a Blog Hop today, hosted by my dear friend, Debi, where we were asked to take a card pattern and use it to create a layout or take a layout to create a card. 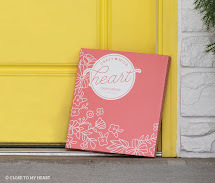 I love that all of our How-To books can be used to serve dual purpose in this capacity. Too cool, right? Talk about getting more for your money! There are 10 ladies participating this month. If you have come from Terry's Blog, you are on the right path! She is always sure to have many treasures to share! You can find a complete listing of blog participants on Debi's Blog if you were to get lost along the way. 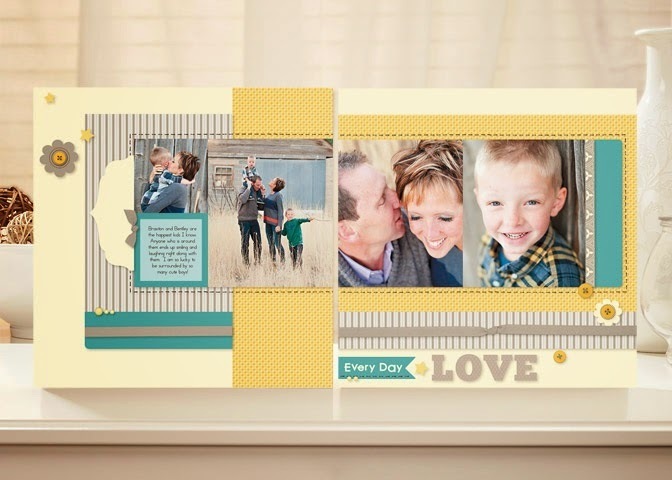 I chose to use a 3 x 3 card pattern as a layout and multiplied the dimensions by 4 in order to create this 12 x 12 layout. I found that a bit challenging in that I always create layouts (2-pages) rather than single pages so I decided to create a piece of artwork that could serve as a title page. (The card pattern I selected can be found in the Originals book). I used the Laughing Lola paper packet as my focus and also incorporated some retired products (paper flower, dimensional alphabet, etc.) to spruce it up a bit. Here are some close-ups of the title. 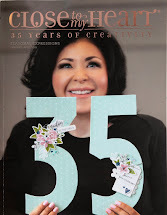 I used our Artbooking cartridge and Cricut Craftroom (aka CCR) to make the title. I welded the letters together so they were "connected" - that is one of my favorite features of CCR. I love the textured dimensional elements and added a little Crystal Blue ink. "The" was spelled using some retired, adhesive letters. 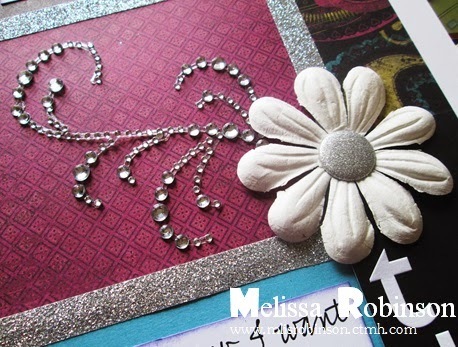 I did not want to take too much away from the focus of the layout but you can never go wrong with a little bling. In fact, I used three different pieces to make the Sparkles Flourishes but you cannot even tell. Yet, I did not feel the main piece was enough. Is there such a thing as too much bling?! I will blog about "The Important Thing" tomorrow. 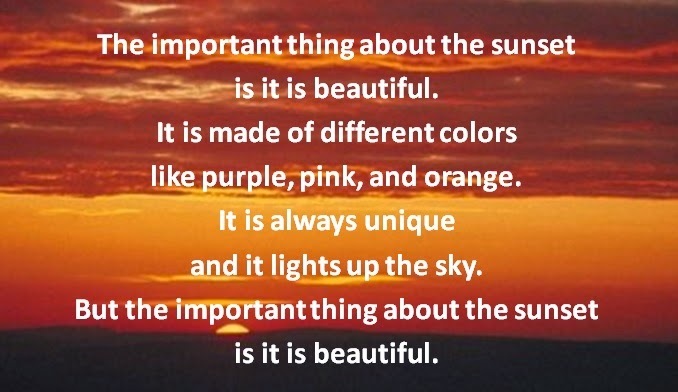 The idea comes from a children's book entitled, "The Important Book" and was shared with me several years ago by a friend of mine named Michelle. It is a fun way to journal and great for writing lessons for students. I shared it with my teachers at a recent training and thought it would be fun to include it here. Join me tomorrow so I can share more. 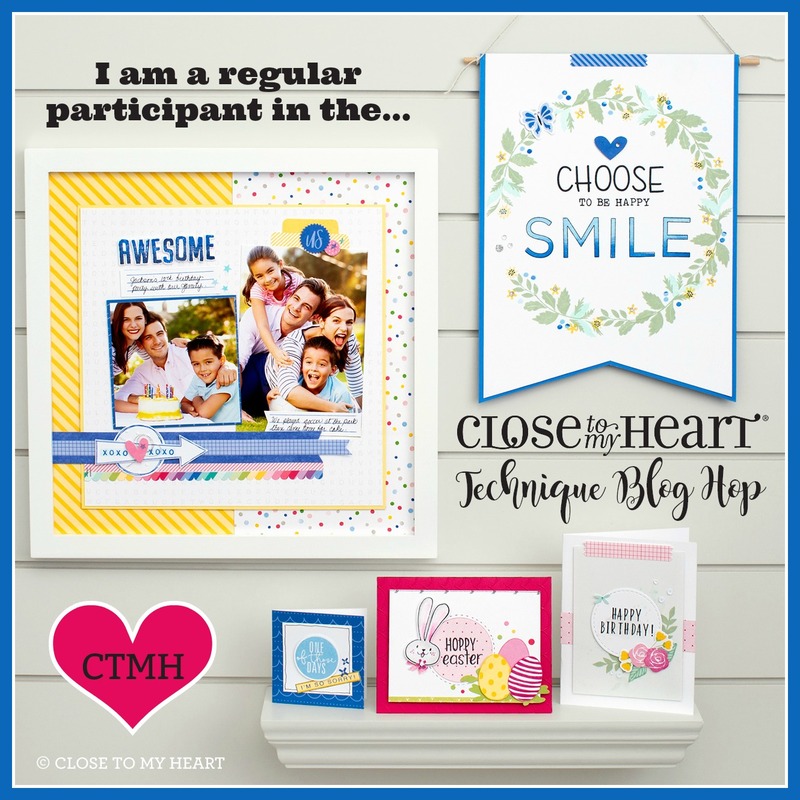 Now, hop on over to Debi's Blog to continue viewing some fun artwork and the rest of the artists' interpretation of this challenge. Thanks for joining us and be sure to let me know what you think of my blog item. I would greatly appreciate. My husband and I went out on a dinner date the other evening and we could not help but take the opportunity for these fun photos. Good ol' Colonel Sanders. Why is colonel spelled colonel? And who can forget Ronald? Oh how I have missed him! Here are Pancho and Villa, my long last compadres. We have too much fun and the weekend is here! 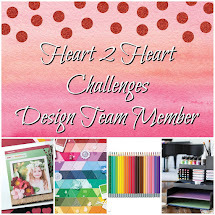 Bring on more fun and stay tuned for tomorrow when you will see some fun artwork via a Blog Hop I am participating in. Studio Savings - Digital Layouts Just $5 This Month! You HAVE to watch this video if even for the option of having your photos printed in a professional manner. 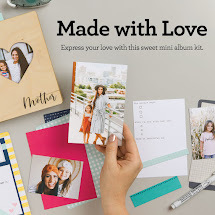 It is such a fun option and I am soooo taking advantage of this as I have layouts that were fun to make but which required small sizes of photos and the photo sizes I had would just not work. This is a great special this month! You can sign up for a FREE account and use the online program for FREE! You only pay when you are ready for them to printed and they are top-notch quality. If you have any questions about Studio J, or if I can help you get started with your first layout, please let me know! You will love me for it! 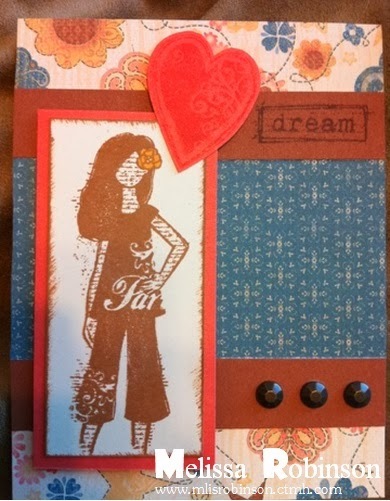 The minute I saw this stamp set called "Dreamer", I knew it had to be mine! I love the images and the saying. 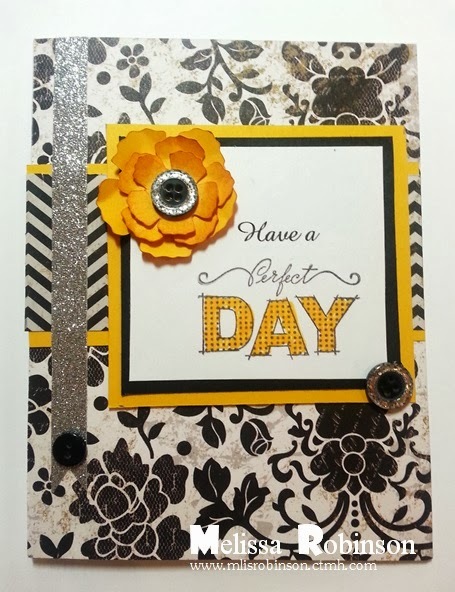 I just love the simplicity of this card, decorated with retired paper and embellishments. Ithink it came out really cute, if I must say so myself, and I look forward to creating more items with it! Time to stamp the weekend away! 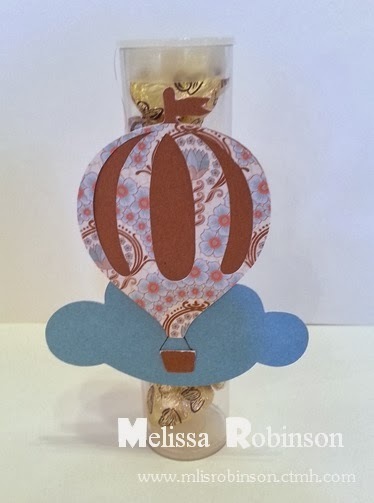 This month a few ladies from my team and I are showcasing some artwork using the Balloon Ride paper packet. The hop is a circle so move through the artwork by click on the link at the end of the post or feel free to hop between blogs by selecting any of the links below. 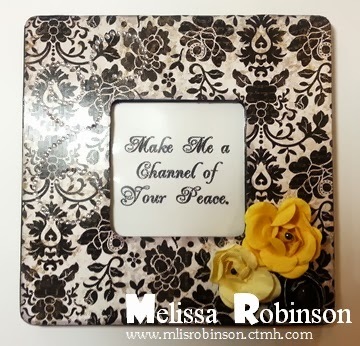 If you are coming from Marianne's Blog, you are on the right track! We truly appreciate you stopping by and hope you will leave some comments and let us know what you think of our creations. Happy hoppin'! 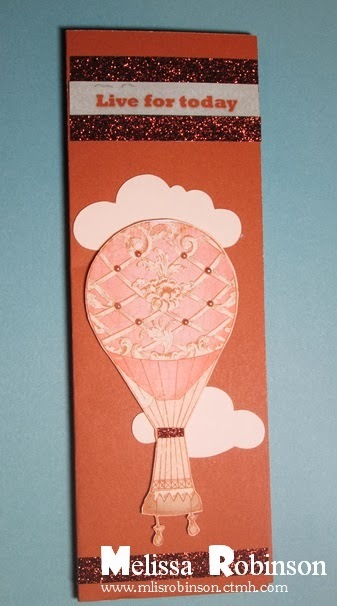 I took the Balloon Ride paper packet and used it, and the Dimensional Elements that coordinate, to decorate it up. The "Live for Today" saying comes from the zip strip (border) on the B&T paper. 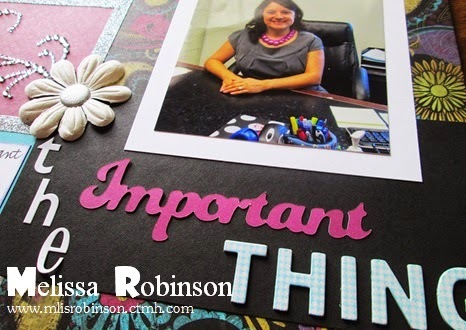 I used some Bronze Shimmer Trim - which really goes great with this paper packet - for some fun accents. The clouds were cut from our Artiste Cricut cartridge and a few little pearls later... I was pleased with the result. This is how it looks with the notepad inside. I plan on giving these to some of my staff members for a little token of appreciation. 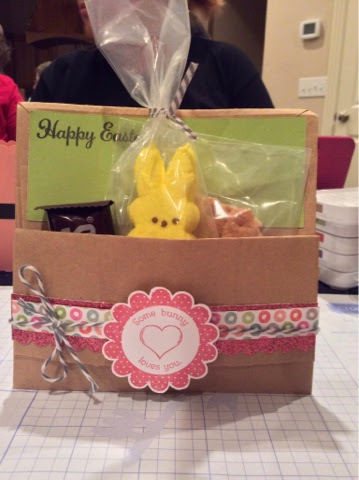 Hop on over to Tonya's Blog and see what she has in store for you! One of the fun things about hosting or attending a retreat is the fun goodies that are usually provided. For me, a retreat isn't a retreat without them. This year I decided to use our My Creations Clear Treat Tubes for a table goodie that would greet the ladies as they arrived. I filled it with Hershey's Kisses (the ones with almonds) - YUM! 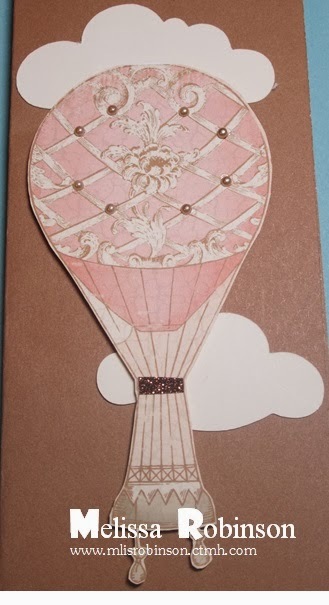 Then, I used our Artiste Cricut cartridge to cut out the hot air balloon and cloud. They came out really cute, I think, and I hope the girls liked them. They were perfect for matching our theme. I hope all of the girls, who attended, soar into new heights this year, both personally and professionally! Here's soaring to new heights! For Always is Still a Hit! Who said you cannot take pictures of someone else's secret sister gifts?! :) My Mom's secret sister, Nancy Van Nice, is totally creative and gave my mom these fabulous creations. I just could not resist taking a picture and sharing them with you. The For Always retired paper packet is a popular one but now retired. There is nothing complex about this card but isn't it absolutely perfect? The little touches make a huge impact on the overall card. She took a wooden frame and altered it as you see here. (You can sometimes get these frames for as little as $1 but doesn't it look like it's worth millions?!) Totally perfect! And lastly, this cute sticky note holder is just one of the other coordinating items contained with my mom's final gift. Nancy did a great job with these gifts and I totally appreciate the ability to create something that nobody else will have but that did not cost a fortune. It is the thought that counts, right?! This is what brought me to Close To My Heart approximately 18 years ago and what keeps me inspired and loving the creativity to this day!